Live streaming service YouTube TV is now officially available across the U.S., though some small gaps remain and other regions may lack access to one or more of the four major broadcasters. The service should be accessible by 98 percent of Americans, YouTube said in an announcement, promising that the remaining 2 percent will come onboard shortly. Prior to this week YouTube TV was already in the country's "top 100" markets, but another 95 have been added. The expansion is presumably geared towards becoming a destination for this year's NFL Super Bowl, scheduled for Feb. 3. The game is one of the few remaining TV "events" in a world of on-demand streaming, attracting tens of millions of viewers and even more in advertiser dollars. Some Americans will even buy new TVs in prepartion for gameday parties. Parts of YouTube's coverage map lack ABC, Fox, and/or NBC, The Verge commented. 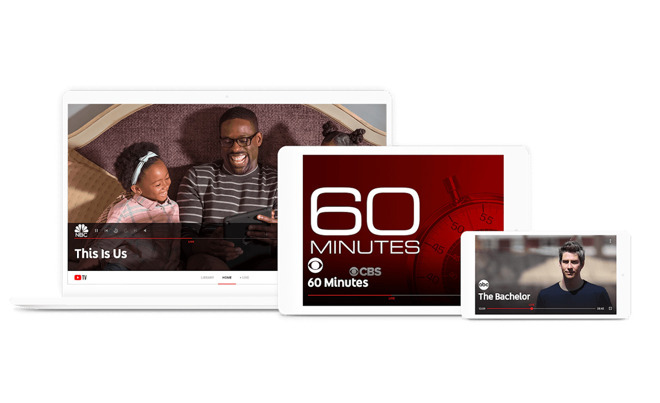 That won't interfere with the Super Bowl, which is on CBS, but one of the selling points of YouTube TV has been access to the "Big Four" broadcasters, something other streaming TV options can't always offer. Other features of the service include an unlimited cloud DVR and support for up to 6 accounts per household. It currently costs $40 per month after a free trial, with add-on packages for channels like Showtime and AMC Premiere. Conspicuously absent though is HBO, along with Viacom channels such as Comedy Central. Supported Apple devices include Macs, iPhones, iPads, and Apple TVs.